Do you need some fresh ideas for holiday stage decorations? Where do you find your inspiration? I often find myself walking around Hobby Lobby looking for something to use to create decorations, props, or costumes. 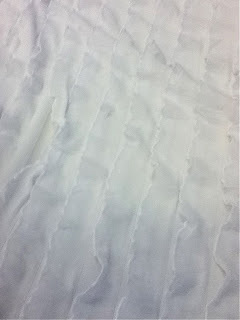 Last year, I struck gold in the fabric department. 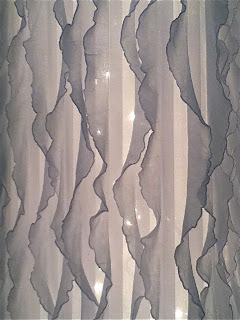 This wispy chiffon with ruffles looked wintery and seemed to be thin enough to use as part of a light fixture. I took the bolt over to the Christmas tree department and held it up in front of the white lights, and it was perfect. I bought fabric, 6 sets of white lights, and 6 extension cords, but still had no idea how I was going to construct the light fixtures. 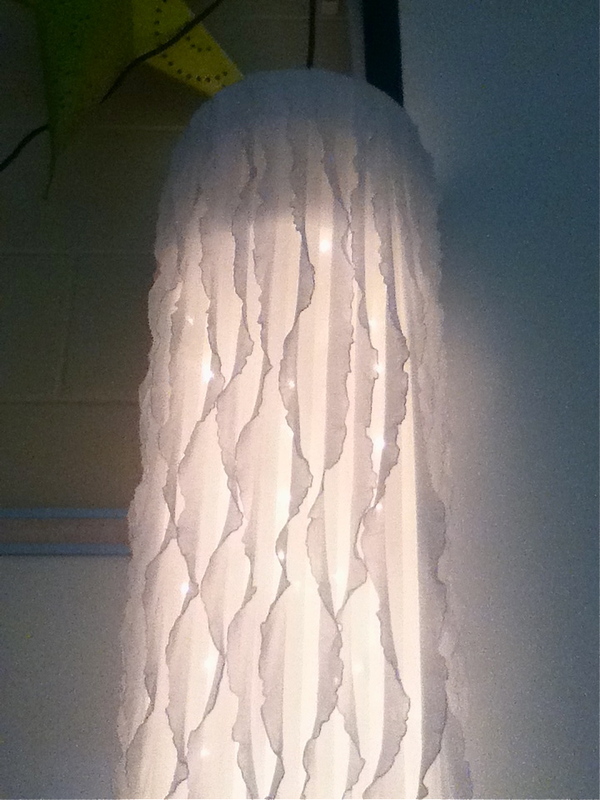 After much deliberation, I decided lamp shades would serve as a good base for the fixtures. I bought 4 circles and 2 rectangles, so I could have 2 sets of three chandeliers. I measured the diameter of the lampshade and cut the fabric accordingly. I used strong clear packaging tape to attach the fabric to the inside of the lampshade. 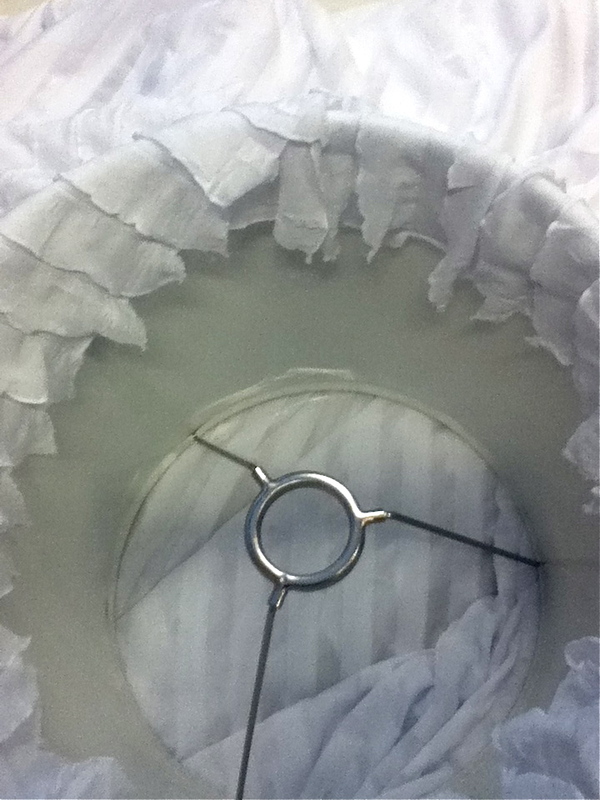 I used the lampshades upside down, so the largest part was on top. 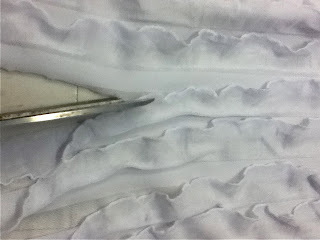 That allowed the fabric to flow straight from the top, instead of fanning out. I forgot to take pictures after placing the lights inside, and now they are all boxed up and stored at school. It was actually quite simple. I used one string of white lights and one basic extension cord (I think they have 3 plugs) per light. The end of the extension cord fit tightly into the metal circle of the shade. I plugged the lights in under the circle, which kept the cord from slipping out when held upright. I took the lights and simply looped the strand around the metal parts of the shade as needed, to keep the lights from hanging out of the bottom. Here is the finished product hanging in my classroom as a test to make sure the tape would hold. I've used the decorations for two years now. Each year, we do 5-6 shows, so they seem to be durable. In addition to making chandeliers, I bought some tulle and created a garland. 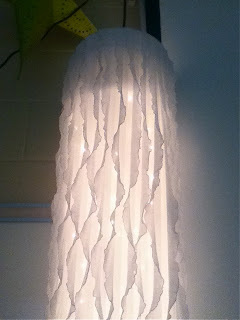 I wrapped the fabric around strands of icicle lights, and used short pieces of tulle to tie and create the bubbles. One last word of advice: Hobby Lobby always has a 40% off coupon for anything that isn't on sale. You can even search for it on your phone, and they will use the electronic coupon. Now, what are you waiting for? Grab a coupon and go shopping! What student doesn't enjoy a field trip? Wouldn't a trip to the New York Philharmonic be an amazing place to take your music students? If you think that is impossible, think again! 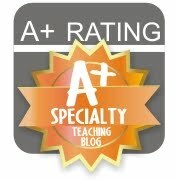 You can take them on a virtual field trip. The New York Philharmonic Kidzone is a fabulous website packed with kid-friendly ways to explore orchestral instruments, learn about composers, and participate in educational music activities. I created a packet to serve as a guide for my students to use while exploring the NY Phil Kids website. Students have four task cards to complete first, which lead them through the Composer's Gallery, Composition Workshop, Instrument Lab, and Instrument Storage. After the tasks are completed, they may explore other areas of the website, which includes many musical games and activities. If you would like to use the packet with your students, plan to allow more than one class period to complete the field trip. You can download a PDF of the packet by clicking the link below. 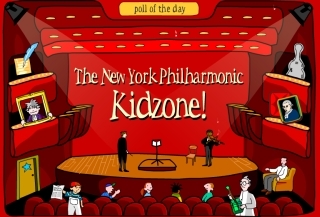 Take a quick spin through the NY Philharmonic Kidzone and see for yourself. It's a great place to visit. You'll be glad you did! It's a busy time of year in the life of a music teacher. The holidays are approaching, which typically means we are in performance mode. I never found time to post anything in November, so I thought I would let you know what we have been up to at Crestline. 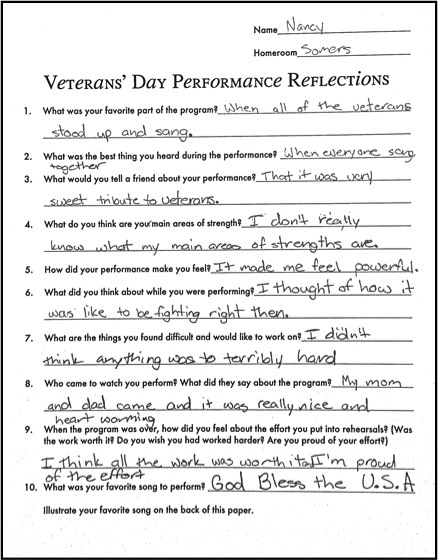 Our 5th graders presented a Veterans' Day Program, and our K-3 students began learning music for their winter concert. Our 5th Grade Veterans' Day Program is a very special tradition at Crestline. Each year, we honor about 100 men and women who have served, or are presently serving, our country in times of war and peace. In addition to the videos, one of the highlights of the program is the performance of "Step In Time," which includes themes from each military branch. Veterans stand when their song is performed. It is always moving to see them join in singing, sometimes with tears streaming down their faces. Although 5th grade students are the only ones who perform that day, any student in the school can honor a veteran. As the veterans stand in front to be recognized (approximately 10 at a time), they are presented a small flag by their student(s). A parent committee organizes this aspect of the program, as well as a breakfast prior to the program. We find that our students feel so much patriotism and respect for veterans after working on this program. It's a very moving performance, and the veterans are always so appreciative. We enjoy making sure our veterans know we are thankful for their service. If you like the idea of a reflection sheet following a performance and would like to use one after your upcoming winter concert, you might like to read my Winter Concert Reflection post for ideas.